A replica of the International Prototype Kilogramme. HUMANKIND IS ABOUT to sever one of the links between its present and its past. The so-called “Grand K” kilogramme, a cylinder of polished platinum-iridium alloy that has been the world’s sole true kilo since 1889, is to be retired. Today, nations gathered in Versailles, west of Paris, are expected to instead approve the use of a scientific formula to define the exact weight of a kilogramme at the General Conference on Weights and Measures. The change will have no discernable impact for most people. Their bathroom scales won’t get kinder and kilos and grams won’t change in supermarkets. But scientists are hailing the vote as a mini-revolution in the field of weights and measures, which underpins vital human activities like international trade. And it will mean redundancy for the Grand K and its six official copies. The stability of Grand K has been a matter of significant concern, resulting in the recent proposals to change the definition to one derived from constants of nature. “We know from comparing the kilogram in Paris with all the copies of the kilogram that are all around the world that there are discrepancies between them and Le Grand K itself,” Dr Stuart Davidson, head of mass spectrometry at the National Physical Laboratory in the UK told the BBC. 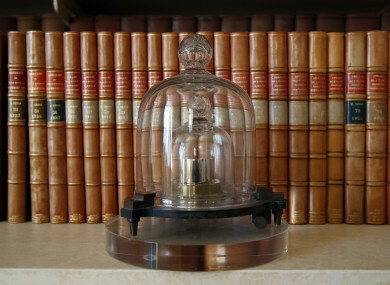 The kilogramme has been based on a physical object certified in 1889 using industrial revolution, consisting of a cylinder of platinum-iridium and it is the last unit to be based on an actual object. As science and technology have progressed, the demands for measurements to underpin new products and services has increased and according to the International Bureau of Weights and Measures, the standard and definition must reflect this increasing accuracy. Email “Take a weight off: Definition of kilogramme set to change ”. Feedback on “Take a weight off: Definition of kilogramme set to change ”.